The Northwich Woodlands is an ideal educational resource. You can find it to the north of Northwich, on over 323 hectares of formerly derelict land. It includes Anderton Nature Park, Marbury Country Park, Ashton's and Neumann's Flashes and Anderton boat Lift. Different forms of Art have allowed people to not only be involved but to care for and have a greater understanding of their environment. The artwork that can be found in the woods at Marbury and Anderton creates interest and atmosphere, reflects the area's cultural and industrial heritage, and captures the imagination in ways that plantations of young trees may not. 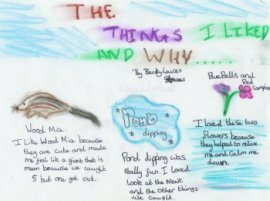 Artists have worked with schools and local groups to come up with sculptural pieces that interpret wildlife, history or are just lovely to look at, and functional artwork - benches and gateways that also have stories to tell if you stop to look and explore around them! In addition to these forms of art, timber and woodland by-products contribute to a range of woodland crafts. 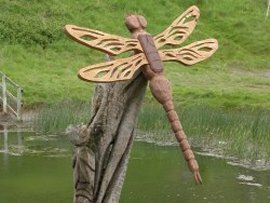 Local wood-turners and special interest groups have been able to utilise these to help an economic product come out of the woodland whilst often training or teaching in workshops local people how to make and use interesting crafts. The woodland exemplifies the decline and dereliction of a local industry, and demonstrates how nature has worked to colonise bare land. It shows how people today affect the landscape (management of land; access improvements, installation of art works, restoration of Boat Lift & Lion Salt Works etc.). For example, Ashton's and Neumann's Flashes are typical of Cheshire's limebeds, the result of lagoons of industrial limewaste that was poured into the enormous areas of subsidence following the collapse of the salt mines. They are now designated as Sites of Biological Importance, having colonised with self sown orchids and other species normally found only on limestone geology. It truly is a unique area. Would your school like to be involved with education activities? Together we can create an exciting programme of field trips and activities ranging from nature trails and art workshops to pond dipping and salt making. The industrial heritage of Northwich begins here, the site of the earliest local salt mines taking over from the Roman's salt making processes. The natural heritage (the site contains 7 Sites of Biological Importance and a Site of Special Scientific Interest) is not only a result of the industrial heritage but in some cases is the industrial heritage. The woodland has potential to cover many aspects of the curriculum, offering a wide range of field visits for geography, sciences, history, art, technology and English. The partnership behind the project is currently developing an Education Strategy- we need you to help us! We need your help to develop activities around the curriculum so we can begin working on a strategy that is meaningful to you as teachers, and can be delivered in a way that's exciting for children and students. If you would like to participate - really get involved - please let us know. The Rangers work closely with local primary schools and the site is used occasionally by local secondary schools. There are opportunities now to market the full potential of the community woodland as an educational resource to local Sixth Form Colleges, Colleges of Further Education, and to all the Universities and Higher Education institutions. The derelict land in particular is often used by post-graduate students for research and comparative studies. If you would like your school to visit the woodlands or be part of the activities, please contact one of the Countryside Rangers at Marbury Country Park, on 01606 77741.